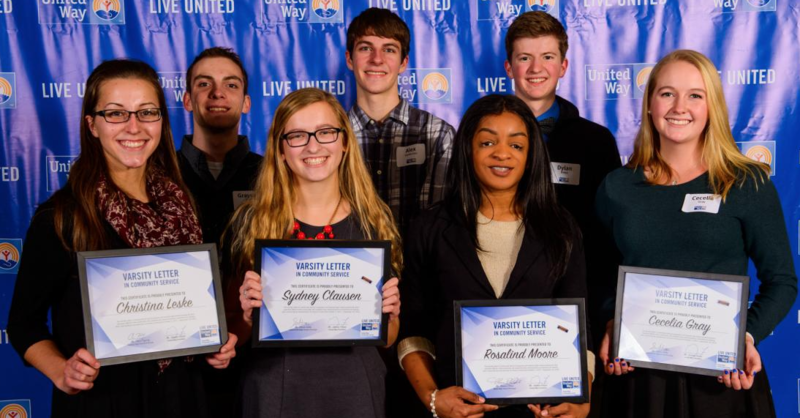 United Way of Olmsted County is partnering with Olmsted County high schools to recognize and reward students for their volunteer efforts in the community. All supplemental materials including; Requirments & Guidelines, Service Log Sheets, Checklists and Verification Forms are included in application form. Student must meet the “Student in Good Standing” qualifications included in these guidelines. Hours are for eligible volunteer work from October 1, 2018 - September 30, 2019. Application deadline is on or before October 2, 2019. United Way of Olmsted County will notify you that we have received your application by email on or before November 16, 2018. United Way of Olmsted County will notify you by December 31, 2018 if you are receiving this award. A student who qualifies for the Varsity Letter in Community Service, will receive a certificate and a community service scroll patch if he/she is a first time recipient or a bar if this is the second, third or fourth year earning the award. These are currently free of charge. You may hand deliver or email your application to our offices at 903 West Center Street, Suite 100, Rochester, MN. Please note that our offices are open Monday-Friday 8:30 AM to 5 PM.